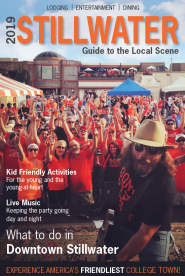 (STILLWATER, OKLA. / March 25, 2015) – The 38th Annual Stillwater Arts Festival will kick off with free live music and food trucks Friday, April 17 beginning at 5 p.m. at the corner of 8th Avenue and Husband Street. Kicking off the night is the Lauren Nichols Band followed by the Val Gladden band at 7 p.m. According to entertainment coordinator Stephanie Gudgel, Nichols is a singer-songwriter from Chandler who is quickly becoming a popular female vocalist across the state. “Lauren is a feisty redhead who is ready to leave her footprint in country music,” she added. Nichols teamed up with country musician Jamie O’Neal to co-write and record seven songs for her debut EP. In addition to live music on Friday night, area food trucks will be available for guests who want dinner or refreshments. The Arts Festival with more than 100 fine artists will open Saturday, April 18 at 10 a.m. This community event is free of charge. The live entertainment continues at 11 a.m. with the Cherokee Maidens and Sycamore Swing. “These ladies are backed by a troupe of crackerjack musicians and make every attempt to keep the western-swing genre authentic and vintage. Twin fiddles, lap steel and yodel in a modal key. It’ll be great,” Gudgel said. Up next at 2 p.m. on Saturday is the Byron Berline Band. Berline is an American fiddle player and is widely recognized as one of the world’s premier fiddle players known for his ability to play almost any style, including traditional bluegrass and western swing music. Free live entertainment continues on Sunday, April 19 from 11 a.m. to 5 p.m. featuring the Stillwater Pipe Band, McTeggart Irish Dancers of Oklahoma, Samuel Grounds, Ciara Speight, Adrienne Blakey, Stillwater Ukelele Association and The McKedys. The Annual Stillwater Arts Festival, a juried art show, is coordinated and presented by the City of Stillwater and is sponsored by Oklahoma Arts Council, Downtown Stillwater, Stillwater Radio, Stillwater News Press and the Arts and Humanities Council of Stillwater. For more information, visit stillwater.org or get updates on the City of Stillwater’s Facebook or Twitter pages.